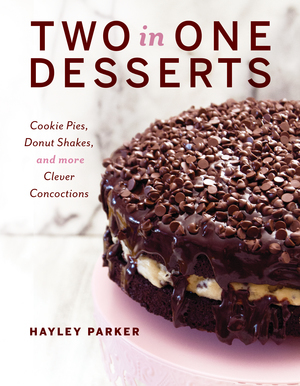 If you love cake batter – and who doesn’t? – you will die and go to HEAVEN with these Cake Batter Gooey Bars! Cake batter flavors always transport me back into my childhood. Since my parents never cooked or baked, when my mom got the baking bug, it was always a treat. During that time, she’d get out her marble pastry slab – passed down from generations ago – and her linen apron. She’d tie her hair up and sprinkle flour liberally over the slab before kneading a risen dough that fragranced the house with its warm aroma. Soft classical music played in the background as she worked her palms into the pliable dough, and in the distance you could hear the birds singing from our front yard. She baked from a box mix. And was probably blasting AC/DC. But she always let us pick out the cake flavor, and my siblings and I always chose the confetti cake. ALWAYS. There’s just something about the confetti cake that’s so irresistible and fantabulous. To me, it seems more gooey, has a better texture, and is just all-around better tasting than even a plain white cake. It’s obviously because I’m addicted to sprinkles. And these Cake Batter Gooey Bars have no shortage of sprinkles! So these bars instantly took me back to that childhood of biting into a buttercream-from-a-can-frosted confetti cupcake and thinking it was the best thing in the world… second only to licking the beaters when she was done with the batter. These bars taste just like cake batter. There’s something magical that happens during the baking process that just transforms them into basically solid cake batter but with a chewy, ultra gooey texture. And duh, obviously sprinkles make everything better. Ready to head back to childhood? 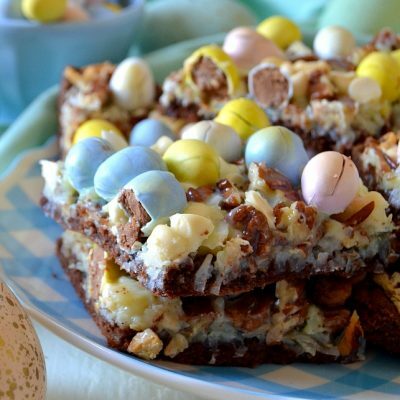 These Cake Batter Gooey Bars are a sprinkle-lover's paradise! Packed with sweet cake batter flavor, these buttery bars are awesome and easy, too! In a large bowl, combine the confetti cake mix, egg and melted butter, stirring until a soft dough forms. Press the dough into the prepared pan in an even layer. Set aside briefly. Wipe out the bowl and add in the cream cheese and eggs, beating well until combined. Add in the almond extract and the powdered sugar, beating well. Lastly, beat in the melted butter, then stir in the sprinkles to combine. Pour the filling over the crust and bake for approx. 35-40 minutes or until the top is light golden brown and the center is just about set. It may still look a little jiggly, but this is okay - you do not want to over-bake them! Cool completely, then refrigerate for at least 2 hours before cutting into bars. Buttery, ultra gooey, chewy and studded with rainbow sprinkles, these Cake Batter Gooey Bars are a cake batter lover’s paradise! Want more Cake Batter goodness? 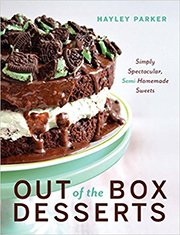 Check out my other cake batter recipes!